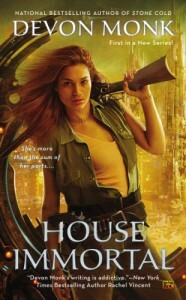 Devon Monk knows how to write ensemble casts, and kickass strong chick first person POV. Already an Allie Beckstrom series fan, I bought this without reading the blurb. I knew whatever she wrote, I'd like it - and I was totally not disappointed. The entire concept surrounding this new series is unique, and I found myself immediately sucked in. I was up most of the night because I needed to keep reading, and now I have a book hangover. Thank goodness the next book is out in roughly 6 months or I would be devastated!